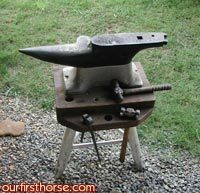 Our new farrier, “J”, came out on Thursday, and we are cautiously optimistic. First of all, he showed up on time, which was a pleasant surprise. He brought his teenage son as an assistant, and they were both polite, friendly and quietly competent. Both horses were less of a pain than usual (although it’s possible that we woke them up when we called them up to the barn); because of that, and the fact that he had help, it took him a good 45 minutes less than it did G. Their feet look great, and J guarantees that the shoes will stay on for at least six weeks – he’ll come out and replace any shoe that falls off before then, no matter what the reason. We didn’t even know farriers offered that kind of guarantee; G was going to charge us $20 to replace the shoe Valentine lost after only 2 weeks – if he had ever shown up, that is. We feel very fortunate to have found this farrier, and even more since he told us that he doesn’t accept new clients. He only agreed to take us on because (1) some of our neighbors are already clients; and (2) more importantly, he’s friends with one of our friends. So we’re very grateful. There is one downside, though – isn’t there always? J charges about 35% more than G ($150 vs $110, for both). However, he returns our calls in a timely manner, shows up on time and guarantees his work. I guess you get what you pay for, right? Once again, we’ll keep you posted.